Helping Teal out here with some info on his new adapter (prototype as of March 2018) for the 150 / 162 HP Yamaha Apex EFI. The Apex motor shares much with the RX-1. It is a inline 4 cyl 1000cc 4 stroke with internal gear reduction and internal rubber dampening. It is EFI and in it's it stock (N/A) form it produces 150 hp on model years 2006-2010 and 162 hp for 2011-2017. Turbo kits are available from several vendors and range from 180-280 HP. In the sled world this motor has an excellent track record in the 7-10 psi boost range (200-230 hp). 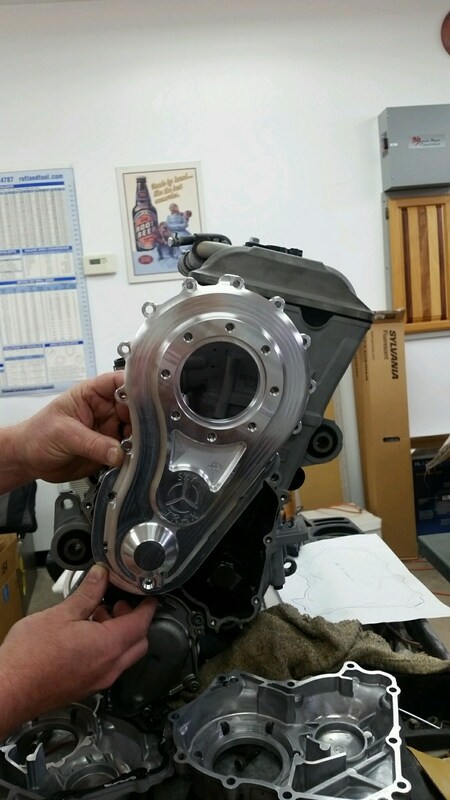 The Apex has the same engine block and mount as the RX-1 but uses a slightly different crankcase end housing so the Skytrax RX-1 adapter cannot be used on the Apex. For the Apex, Teal decided to go with a gearbox and adapter as an "all in one" unit. 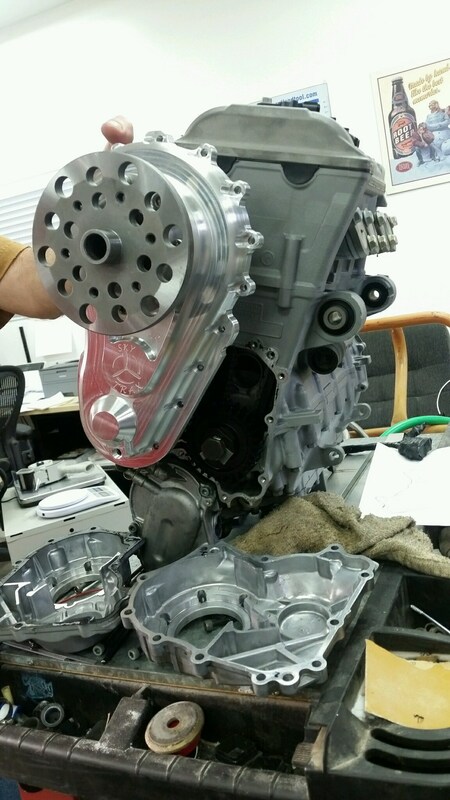 This replaces the end housing (as did the RX-1 adapter) which has the advantage of more rigidity (more consistent gearbox alignment with pto) and wider spaced, more robust (with more fasteners) mounting of the gearbox to the engine. The total engine and adapter length is reduced greatly from the RX-1 with C box (which was about 27.75") by approx 4 or 5 inches. This new setup also eliminates the need to source a Rotax C / E gearbox as was necessary for the RX-1 adapter. This new gearbox is a three gear design (pto drive gear not pictured below) so it'll turn a CW (Right) prop. 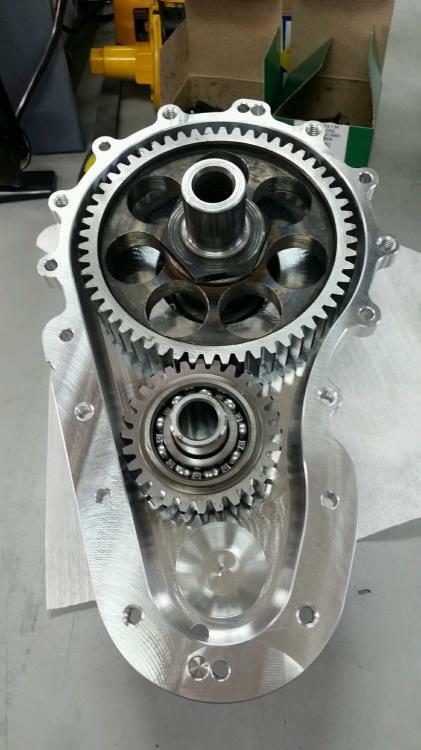 Weight for entire gearbox/adapter (with oil) is projected at slightly under 19 lbs. Installed engine weight (total with everything fwf) falls in the 155-170 lb range. Over in the "Yamaha Aircraft Conversions" Facebook group we have Jim Hensel of Spa City Sled parts who parts out sleds and has quoted prices for used mid-mileage version 1 Apex motors from approx $2000 shipped to cont US. This includes all accessories to run the engine. Teals preliminary estimate for the gearbox is in the neighborhood of $3000. Fully liquid cooled (no shock heat / cool issues) and also no need to preheat or cowl blanket a snowmo engine! No carb heat required (RX-1 uses liquid heated and also electric heated carbs). 35 amp, 490 watt alternator (stator) integrated within the mag side of the motor. 4 individual coils (over each spark plug) gives a level of redundancy in the ignition system. Tests (snowmobile and aircraft) have shown approx 80-85 hp output running on 3 (out of 4) cylinders. Does this system use a clutch to aid in starting with a large prop? Teal did not design a clutch option into the new gearbox. I am a big fan of the centrifugal clutch, but the thought is that the Apex, with more precise and advanced ignition timing and fuel control via EFI, will handle the "starter rpm to idle rpm" transition better than the RX-1. Option "B" would possibly be some sort of a prop hub clutch solution which, with the compact nature that this gearbox has, there should be ample room to accommodate. How bout when the water temp gets to hot I know the 3 cylinder Nitro engines go into a limp mode and stay there till the water temp goes back down. Does these engines do that as well. That would be bad while flying. Limp modes like that are definitely a big concern. Right now the solution for that one is to simply unplug the lead from the ECU to the temp sensor. The ECU then assumes normal operating temperature. For better cold starts one could easily incorporate a connect/disconnect (start/fly) switch for the temp sender. There may be a better solution down the road in a custom ECU that has no limp modes. Then a person could feed all sensors and info to the ECU at all times with no worries. How much horsepower is the adapter/reducer combination going to be designed for? The full Turbo'd power or something less? If around the 200HP range or more, that opens the engine up to a lot of experimentals. maybe you guys will find somebody to re flash that ECU someday. At 2000 for a used engine and 3000 for a gearbox your in the used 912 price range but way more hp. Might have to get me one of these someday. Yep most yamaha coversions come in around $7 or 8K counting all the little costs. Tempting if you want big power since modded 912s or the135hp 915 runs a wee bit more! Also nice to have abundant cheap parts (used and new), but for now going Yamaha does put the "experimenting" into "experimental" to more of a degree than going Rotax. Hopefully that will change when more options for standard proven configurations and FWF fabricated components become available for other planes like they are for Just Aircraft through Steve at Wild West. Hopefully Teal will come in and let us know what the engineering calcs show for power capacity, but I do know that there are a couple guys with turbos that are hoping to prove it's real world capability through some rigorous ground testing with boosted power. I am conservatly saying that it is cabable of 150 hp continious and 200 Hp. Intermitten. Thats not to say thst it wont handle more than that. 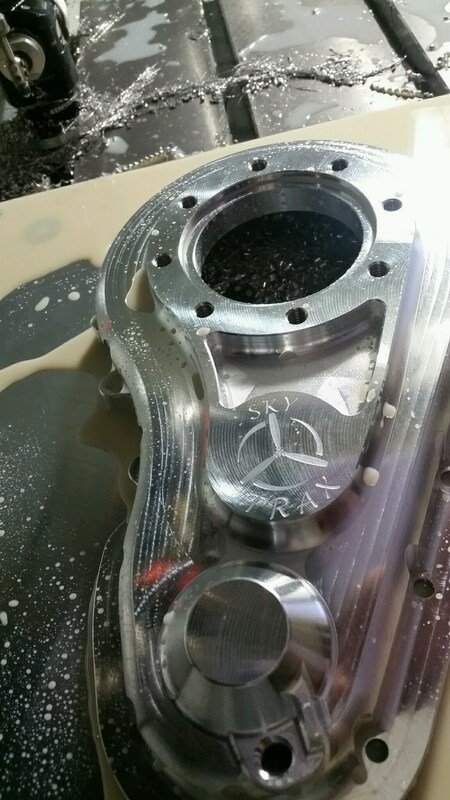 Weight for entire gearbox/adapter (with oil) is projected at slightly under 19 lbs. Installed engine weight (total with everything fwf) falls in the 165 - 185 lb range. What does one need to do to open this chart? I get 404 error. To get prop speed do I need to divide engine rpm by 3.83 and 1.23 or just the 3.83? Thanks! Going to be a slow prop. Thanks Teal. That gets you pretty close to competing with Lycoming/Continental 360's (180 - 200hp rated). That is a sweet spot for a very large part of the market. It isn't particularly of interest to this group, but getting it up where it can be considered for an RV/Glassair/etc. installation opens up a huge market, which makes the motor/adapter more viable for us as well. 80 to 100 lbs lighter for a firewall forward compared to a 0-360. So one might have to hang lead in the engine compartment to maintain CG. The FF intalled weight of the RX1 with everthing on it is aprx. 165 lbs depending on radiator and header choices. The Apex should be about 8 lbs less. The 912 FF is about 150 lbs. The 914 is aprx.175lbs. These weights are aprx. And I would love to hear anyone chime in on their actuall measurements. As a reference bare engine weight of the RX1 is 118 lb. So add carbs, airbox, radiator, exaust, ecu,voltage reg., oil, coolant. Gearbox/adapter and misc. Plumbing. Looks like Teal answered your question, but I wanted to add that with Steve Henry on your side you have a totally unfair advantage over the rest of us if you end up going Yamaha! If his headers, motor mount, and other fabricated parts would have bolted up and fit my KF like they would on a Just firewall I woulda bought them in a second! Thanks for the quick response Teal. That is useful info. So, the 162hp quoted for the 2011-2017 Apex motors, is this continuous hp or something else?